This week marks the last week of 80 Day Obsession or Peak Week as it’s called in the plan. The nutrition plan for Peak Week involves 4 “Deplete Days” that are lower in carbs and higher in protein. Again, it’s all normal food so if you’re not following 80 Day Obsession you will still find some healthy meal ideas. Phase 3 of 80 Day Obsession is complete and there is just one week left to round out our 80 days. Peak Week workouts include a different workout from each phase. It’s designed to show you just how far you’ve come in the past 80 days. Peak Week nutrition includes some deplete days to help you get extra toned for those after photos. During Peak Week you add 4 Deplete Days to your meal plan. Two deplete days, a normal day, followed by 2 deplete days. Deplete days are lower in carbs and higher in protein and veggies. According to the 80 Day Obsession plan materials, reducing carbs and increasing protein taps glycogen from your muscles, causing you to look more ripped. The program emphasizes that this is a temporary strategy. We usually add deplete days to our meal plan before a vacation, especially if we’re heading to the beach. Before our trip to Grand Cayman we followed the 80 Day Obsession deplete days and got great results. 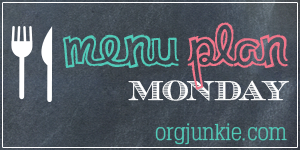 I am happy to find your blog from the meal plan Monday link up:) It’s all so organized! Love & can’t wait to try! Thanks for stopping by Cassidy!